There are so many reasons to make the change. We want to educate and inform those who have not yet discovered it, that there is an easy way to become a non-polluter. It’s easy, fast, inexpensive and a lot of fun. Adopt the microbes! If you love to grow vegetables or build ornamental gardens that are rich and vibrant free of chemical fertilizers and pesticides, than bokashi fermenting is exactly what you want to do. The microbes will rapidly convert organic waste material into nutrients that will feed your plants. Pet waste can be rapidly transformed into nutrients for your ornamental garden instead of ending up in the landfill or polluting ground water. Even if you are not interested in gardening, you will see many reasons to change from throwing out the trash to fermenting the trash. It will save you money and time and will as you will see below clean up the air, water, and soil. If you live in a crowded city and take your dog or pet to a park then you ought to be fermenting the pet waste. Where do you think the plastic bags of pet waste end up? You can safely dispose of cat or dog feces with a fermenter and stop the ground water pollution related to water run-off. Most people don’t realize there is a third alternative to disposing of waste material that is far safer than using landfills or composting. It is faster, cleaner and very scalable. It is far less costly and something you can do right at home. I’m going to give you 10 reasons to make the switch from composting to fermenting. We are talking about a special type of fermenting called Bokashi Fermenting (acidic anaerobic fermenting). The Bokashi fermenting is a simple solution. Here, specialized microbes are allowed to work on the biomass where there is no oxygen (the anaerobic process). The microbes work best when they are undisturbed and do their job very quickly fermenting (pickling) the biomass. The microbes work together attacking the mass with enzymes (chemicals microbes use to break structures down). No gases are liberated. Carbon is not oxidized (carbon dioxide does not form and enter the atmosphere because there is no oxygen present during the process), no putrefaction (foul odors) is produced, and most importantly the nitrogen remains in a form that plants can readily use. The process occurs at low temperatures, never heating up as occurs during composting, and is complete in less than 1/10 the time it takes to compost a biomass. When the fermented product is put into the ground, the soil microbes take over and quickly do the final conversion to enriched soil. None of the water in the biomass is lost. Soil microbes are replenished. Soil is properly amended and plants grow well without the heavy dependence on fertilizers and pesticides. No mixing or turning is required and the process, unlike composting, does not contribute to global warming. Most of us are accustomed to noxious odors and fouled air if we live anywhere near urban centers. 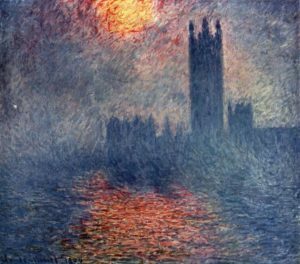 Monet in 1904 captured the heavy and polluted London scene in his 1904 painting of Parliament that may be beautiful but was also deadly. 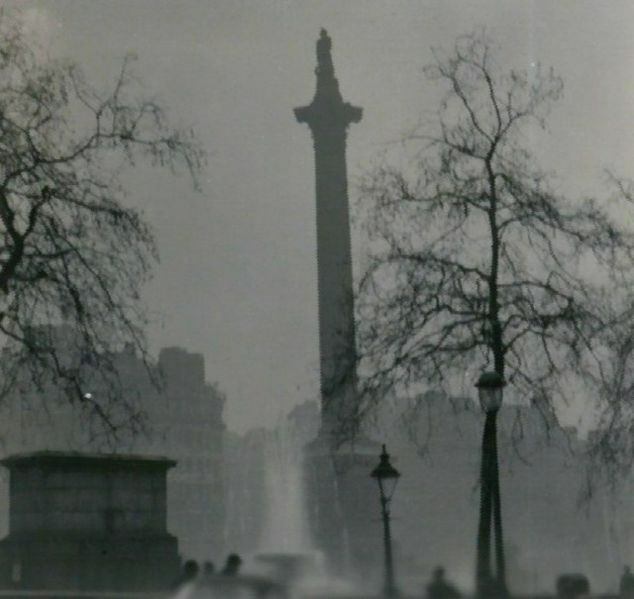 In the 1950’s with coal soot contributions to atmospheric pollution degraded, pollution and smog were evident in the city. Man is the generator of most of the planetary pollutants. Although much of the polluting is blamed on petro fuels, cars, and trucks, the volume of rotting garbage, agricultural composting, and carbon dioxide generators contribute very substantially to polluting the air. Maybe it will take a little time to solve the transportation problem, but we can immediately put an end to open air oxidation. Allowing waste to end up in the landfill or composting it generates a lot of carbon dioxide, methane, sulfurous and nitrogenous gases that all contribute to global warming and air pollution. When you bokashi ferment in an anaerobic (oxygen excluding) chamber it puts an immediate end to this polluting process. You can do it now……….it’s easy and fast. And it is a lot less work. Do it at home. It will take a little time for industry to realize that there is a better way to treat waste material. So much time and energy was put into permitting, building, and supporting composting sites that it is hard for many to consider the alternative. Once they come to realize that bokashi fermenting is 10 times faster, requires but a fraction of the land because you don’t need to windrow, and gets rid of the huge investment in leasing or buying heavy machinery needed to compost, the transformation will occur. Think of all of the fuel savings that will occur with this transformation. Most people know that water is a scarce and limited resource. Clean water is essential. We should do everything possible to conserve our water wisely. When you allow water to vaporize and escape into the atmosphere the land from which it escaped is desiccated. If you are farming and composting, a lot of the water you are using escapes to the atmosphere and you need to add water to the compost to keep it working. That water is better used on your crops. Municipalities with composting permitted sites are wasting water because it has to be added to the compost to keep the process working. These requirements make it costly to compost and are totally avoidable. The clean water you bought is being wasted and diverted to a process that does not conserve water. When you bokashi ferment industrially or at home, all of the water contained in the organic matter (food scraps or pet waste) is retained in the sealed fermenter. With bokashi fermenting the water is being retained and in the metabolic degrading of waste material more water is being produced. It is all retained and secure. The bokashi tea produced is rich in nutrients and useful microbes and spreading it in the garden is a better use than allowing water to escape to the atmosphere. And with fermenting you deliver virtually 100% of the nutrients back to the land with the water instead of taking fresh water out of the reservoirs. This is just a better way of managing one of our very precious resources and it can be done now. The rich fermented product formed when you breakdown the organic waste is mixed with the soil in the second stage in bokashi fermenting. This results in its rapid transformation to nutrient rich soil for your plants with an expanded number and diversity of soil microbes. The nutrients and microbes support the plants and reduce dependence on pesticides and fertilizers which most people know poison soils over time. We love our pets. Dogs and cats produce a lot of feces and we don’t have a simple solution to keep it out of the ground water. When waste is allowed to sit on the surface, the parasites and pathogenic microbes (E. coli, Toxoplasmosis, etc.) end up in the water table where they have to be removed before we can safely consume the water. Those parasites and microbes can affect wild animals and fish too. We know our streams, lakes and rivers are polluted with an ever increasing number of microbes. It’s water run-off and the growing number of pets all contributing to this problem. Dog parks and plastic bags? That’s not the solution. When you put the feces in a plastic bag and into the trash or barrel at the dog park it just ends up in a landfill. Now you have a buried pile of methane producing feces and plastic. What do you do at home? If you bury it, it will in time be properly eliminated but water will still run through the mess polluting the water table. If you flush it, it puts more stress on municipalities to treat the added load of sewage. Toxoplasmosis, common in cat feces is difficult and costly to get out of the water supply. Most people use plastic bags to line the garbage can and to help eliminate the messy garbage and smells. When you bokashi ferment you don’t use plastic bags. They won’t break down and should not be used. Why buy plastic bags that will cost you more to handle messy garbage when it will end up in a landfill or in the ocean or water system? What about biodegradable plastic bags? You really don’t want to use them at all. They are of two types but neither is truly as degradable as you might have thought. The corn-starch derived bags are designed to breakdown with high temperatures in the presence of moisture. They are intended for commercial composting sites where material is windrowed. If they end up in a landfill it will take many thousands of years to decompose. If they blow around on the surface, they will contribute to the unsightly mess we see everywhere and they won’t break down rapidly even when wet. They require high temperatures to “breakdown”. Do the bags really breakdown? No. What really happens is that with the high temperature and heat the cross links break apart between long linear plastic polymers. These are the corn-starch links and may make up 5% of the plastic composition. This leads to a deposition of long strands of plastic polymers (like microscopic threads) that remain in the end product for thousands of years. You can see what will come of this. As more and more of the corn-starch derived plastics are put through the system, more and more polymeric plastic ends up in the soil and water. Think of the long term effect on soil microbes and animals. Do you know how this is going to impact life on the planet? Nobody knows. The other so called water soluble plastic bags are similar but they have a polyvinyl alcohol composition instead of corn-starch cross link. This link hydrolyzes and breaks down when agitated in water releasing the long strand plastic inert polymers directly in the water. Do you think it is a good idea to use “flushable” plastics? Bokashi fermenting completely eliminates the need to use plastic polymers in handling waste material. It conserves water and prevents ground water contamination. We’ve spoken previously about the need to restore microbial diversity to our soil. Most soils have been polluted by industrial contamination, excess use of fertilizers, pesticides or poor management. When you stop adding chemicals to the soil and allow nutrients derived from fermented organic material to mix in with the soil and naturally resident microbes, the result is an expanded population of soil microbes. This leads to an expansion in numbers and diversity of microbes and depending on the local situation (composition of soil, light, moisture, etc.) the situation shifts favorably to re-establish a niche of checks and balances with microbes and plants co-existing optimally. It is this synergy we hope to establish that results in a truly sustainable process of recycling. It is interesting to observe that there is an initial fermenting (pickling) step that is required before the product can be put to the soil in order to rapidly and effectively recycle nutrients. We suspect this is related to normal defenses plants and animals have that prevent their being digested by naturally occurring microbes. It appears that the acidic fermenting microbes are capable of removing the natural defense (waxy coatings, cellulose polymers, etc.) protecting material from being digested (metabolized) at anytime. Raw waste material simply mixed with soil will not readily breakdown, will attract rodents and flies, and will smell. Bokashi fermented (acidic anaerobic fermented) waste will rapidly convert to nutrient rich soil. With bokashi fermenting in a closed container under acidic anaerobic conditions the greenhouse gas emissions are virtually eliminated compared to composting. This is because the process of fermenting occurs under acidic conditions in the absence of oxygen. Methane gas cannot form under these conditions because the organisms that produce methane gas do not survive or produce gas unless the pH is neutral. This is a well known fact and in numerous measurements no methane is ever detected. Carbon dioxide is profoundly reduced because unlike composting where oxygen is abundant and needed, in this process it is eliminated. This is why virtually all of the carbon in the waste material ends up in the soil. No heat is generated or needed. The microbes in the bokashi culture mix are non-pathogenic organisms ideally suited to thrive and dominate the metabolic process of breaking down waste in an environment that is very hostile to competitors. Normal pathogens in the waste material perish and become themselves metabolized (broken down to nutrients). Generally speaking in nature, you are either eating or being eaten. The noxious odors associated with rotting food occur when microbes begin to metabolize waste material. These odors are associated with products being formed. Ammonia, sulfurous emissions, and putrefaction in general are frequently linked to anaerobic decomposition but it requires a neutral or alkaline setting to occur. When you compost and the pile gets wet, oxygen gets excluded and that is why composting can produce foul odors and it attracts flies. If you have meat or dairy products in the pile, things get much worse. Rats and vermin are attracted. They don’t like spoiled food generally but know fresh food is to be found in the pile. When you ferment under acidic conditions, the odor is different. Essentially you are pickling the waste material. It has a sweet acrid pickle smell to it. No maggots, flies, or vermin can survive in this system because they need oxygen. Once the process is complete, the material is buried in the soil where microbes rapidly digest the fermented material rendering a rich soil within typically 7 – 10 days. The buried fermented material is not attractive to animals and is bitter to the taste. It is important to mix it well with the soil and cover it with about 8 inches of soil so that it can be quickly degraded. In the winter you can leave it in a separate container frozen all winter and then put it in the ground when soil is soft. Fermenting is done all throughout the year unlike composting. We already pointed out how fermenting conserves water. The retained water in the system goes straight to soil. More water is generated (released) as the microbes break down the waste material. You never have to add water to the system. You remove the liquid tea and dilute 1:100 with water to feed your house plants and garden or lawn. Water vapor is not lost to the atmosphere contributing to smog and air pollution and the heating up of the earth. Soil amended with fermented waste material holds water better requiring less frequent watering of the garden or lawn. Bokashi fermenting of waste means you are no longer sending your organic waste to the garbage can. The only thing heading to the landfill is non-recyclable material. No plastic bags or pet waste goes to the landfill. Save land for a better use. I realize that many people who love composting may be upset to hear that this not the best way to handle organic waste. Those who think it through deeply will come to realize that composting is inefficient. It is better than land filling but it is far, far, inferior to bokashi fermenting. When you oxidize material it takes a lot of energy and uses up our precious water resource. You have to mix carbon rich material with nitrogen rich material to establish a proper mix (C:N 30:1). This consumes carbon that would be better used in other applications. The carbon is oxidized forming carbon dioxide that does contribute to heating up of the planet. You have to add water to the compost as it is turned to sustain about 50% hydration. This is a waste of one of our precious resources. We will run out of both water and carbon if we continue in this trend. Composting is slow compared to acidic anaerobic fermenting (conservatively taking 10 times longer) and industrially takes up a lot of land and consumes a lot of fuel. That can be eliminated overnight. Scientifically it makes no sense. The average cost to bokashi ferment your waste material will be about $4 per month. If you pay for garbage hauling, because your can size and frequency of having it picked up are dramatically reduced, there is a real savings. Most of those who pay for a pickup service at home save $10 – $15 dollars per month on the trash bill. You won’t need those plastic bags anymore. You won’t need to buy chemical fertilizers or pesticides and hopefully you will realize that they are more harmful than helpful. Commercial operators can process organic waste at about $25 per ton which is far below their current operating cost for materials. In summary, there are many reasons to consider why you should make the change. Adopting microbes to do your work is easy. They work 24 hours per day, never complain, eat virtually all organic waste material and do it quickly. They thank you for the privilege by giving you great things for your garden. You will enjoy the vibrant lush garden products at a savings in both labor and cost.